It wasn’t long ago that Apple rose to the challenge of Microsoft’s 12.3-inch Surface Pro with its very own 12.9-inch iPad Pro. So it was only a matter of time before Microsoft responded to Apple in kind with its own 10-inch tablet (again): the Surface Go. The Surface Go seems tailor-made to combat the latest 9.7-inch iPad with Apple Pencil support, both in the consumer and education realms. It features a brand-new, Alcantara fabric Type Cover and support for the Surface Pen, not to mention a nearly identical power profile. 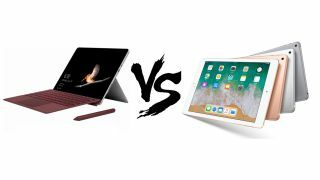 So, now that both Apple and Microsoft have tablets designed for learning and productivity (and play, too), which one should you buy? To answer that question, let’s pit these two tablets against each other in a head-to-head match. Oddly enough, both the iPad and Surface Go remain largely unchanged in design from their forebears. Microsoft’s tablet simply takes the Surface formula and shrinks it, gaining more curved edges compared with the Surface Pro. The iPad, meanwhile, largely maintains the design of the previous models. The Windows tablet still maintains its trademark kickstand, which is a boon for creative types that often use a stylus. Apple’s iPad has no such feature, although you can manipulate the Smart Cover keyboard to get a (remotely) similar feel. Both tablets are incredibly thin, but the iPad’s 0.29 inches (7.5mm) of thinness narrowly beats out the Surface Go at 0.33 inches (8.3mm). Likewise, the iPad is a little lighter than Surface Go at 1.03 pounds (469g) to the Surface’s 1.15 pounds (522g). Naturally, these differences would be difficult to discern when either tablet is in your hand or in your bag. However, those differences in size and weight do facilitate a big advantage that the Surface Go has: ports. Compared to the new iPad’s sole Lightning connector, the Surface Go has a veritable bevy of ports, from USB-C to microSD to Microsoft’s own Surface Connect port. This makes Microsoft’s design much more additive and modular, whereas a core conceit of the iPad is that it’s self-sufficient, so shouldn’t need enhancements through connectivity. Another key difference is that the Surface Go can run the full version of Windows 10, Microsoft's desktop and laptop operating system (you'll need to upgrade from the 'lite' Windows 10 S, which the Go is running out of the box), whereas the iPad runs the same iOS that's used on the iPhone, with a few enhancements such as stylus support. While the Surface Go might have the iPad beat when it comes to design on account of its versatility and openness in addition to beauty, Apple remains a king of displays. The iPad largely remains unchallenged in this regard, but Microsoft is clearly catching up – fast. The latest iPad sports a 9.7-inch IPS touchscreen at a 2,048 x 1,536 pixel resolution, or 264 pixels per inch (ppi) and covered in fingerprint-resistant oleophobic coating. It’s just as color rich and accurate of a display as you’ve grown used to, now supporting styluses. Microsoft’s Surface Go, however, isn’t nearly as sharp with its 10-inch, 1,800 x 1,200 (217 ppi) touch display. Now, the art professional might notice a difference between these two resolution points, but the average users likely won’t. Regardless, the brass tax is that the iPad Pro display appears to be better than the Surface Go’s on account of its sharpness and leading color reproduction. Microsoft is selling its Surface Go to start at $399 (£379, AU$599), which is considerably pricier than the iPad’s $329 (£319, AU$469). However, the devil is in the details. The Surface Go comes packing the same Intel Pentium Gold processor with 4GB of memory and 64GB of eMMC storage for that price, which can be upgrade to house 8GB of RAM and 128GB of SSD storage. Meanwhile, the iPad starts with 2GB of RAM that cannot be improved and 32GB of storage that goes up straight to 128GB. On paper, the Surface Go’s extra memory and storage resources will give it a serious edge against the more limited iPad. However, you’re paying more for that advantage, a cost that remains steadily above that of the iPad as you purchase the essential accessories for either tablet – which are infuriatingly sold separately. While we can’t make too much judgment on how these two devices’ perform differently in the wild, still having yet to fully test the Surface Go, we can look at what each is packing and make some educated observations. Despite the fact that Apple uses ARM-made silicon to make its products versus Microsoft’s use of Intel chips inside its smallest tablet yet, we’ve witnessed similar experiences within both products. The iPad’s A10 Fusion chip produces very similar 3D effects to what the Surface Go showed off during a recent demonstration. With both the iPad’s A10 and the Intel Pentium Gold inside the Surface Go being relatively low-power processors, the former is rated for 10 hours of battery life while the latter claims just 9 hours. We’ll have to judge all that in a final review of the Surface Go, but Apple may have Microsoft beat on battery life regardless. For many people looking for a tablet rather than a laptop to do work or school tasks with, this will be a difficult decision. Both tablets offer about the same power for about the same price, in similarly luxurious builds and innovative design. However, one major benefit the Surface Go holds over the iPad is that, even with Windows 10 S, it’s still far more versatile than the iPad. Upgrade that to Windows 10 Pro for free, and it’s almost no contest (assuming the tablet still performs as well when running the full operating system). Whether you buy a new iPad or the Surface as your next ‘get stuff done’ tablet will depend heavily upon whether you need a full operating system to get things done. If you need a mouse experience on your tablet, then hit up the Surface Go. If you care more about the ecosystem you’re locked into or vast app support, then by all means check out the new iPad. Check out our New iPad (2018) 48hr review video below.